Cameroon striker Samuel Eto'o was named African Footballer of the Year for a record fourth time at the annual CAF awards ceremony in Cairo on Monday. The 29-year-old native of central town Nkon finished ahead of first-time finalist Asamoah Gyan of Ghana and former winner Didier Drogba of Côte d'Ivoire in a poll among national coaches on the continent. 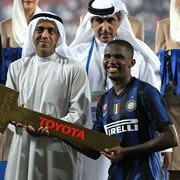 Eto'o, who won the most prestigious African football individual honour three years in a row from 2003, was voted the best player at the FIFA Club World Cup won by his Italian team Inter Milan last Saturday. The Cameroonian scored a clinical, close-range second goal in a 3-0 triumph over TP Mazembe from Democratic Republic of Congo, the first African club to reach the final of the competition. Inter are now champions of the world, Europe and Italy and the goals of former Real Madrid, Real Mallorca and Barcelona star Eto'o have played a pivotal role in those successes. However, he had meagre success as captain of the Cameroon Indomitable Lions this year with the team making a meek quarter-final exit from the CAF Africa Cup of Nations in Angola. The leading all-time scorer in this competition scored once against Zambia and Tunisia, but the Lions suffered a shock group loss to Gabon and defending champions Egypt outclassed them in the first knockout round. Cameron then fared disastrously at the first FIFA World Cup™ hosted by Africa last June, losing all three group matches under the leadership of Eto'o and were the first country eliminated from the competition. TP Mazembe, the four-time CAF African Champions League winners who stunned Internacional of Brazil 2-0 in the United Arab Emirates last week before finishing runners-up to Inter Milan, were named Club of the Year. Milovan Rajevac, the humble Serb coach who made 2010 such a memorable year for Ghana, took the Coach of the Year award. He resigned after the FIFA World Cup to join Saudi Arabian club Al-Ittihad Jeddah. Other award winners included Al-Ahly and Egypt midfielder Ahmed Hassan (Africa-based Player) and Ghana midfielder Kwadwo Asamoah (Most Promising Talent) while Ghana were predictably named best national team.